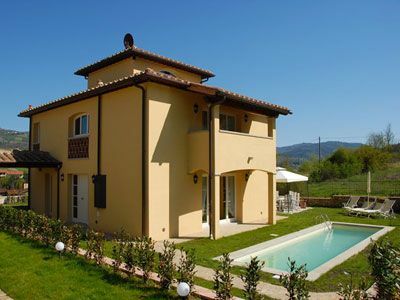 Casa Verdiana is a villa in traditional toscan style, with wood and handmade terracottaroofs and attics. The floors on the ground floor are in porcelain gres (similar to the terracotta), whilst on the first floor it's in a traditional wood. The name of the villa is Verdiana because it is mostly green inside. Green has a balancing action and general welfare. The green is 'the color of nature and it promotes harmony because it has a calming influence on the nervous system. The desire for green lawns and trees that comes after a period of time between the gray stones and red brick of the city is the instinctive yearning for toning the color of nature. Green is peace and refreshment.